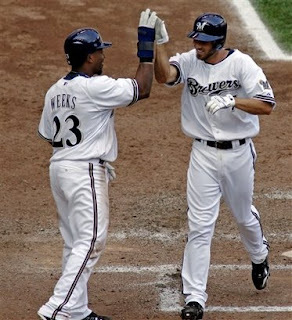 Brewers Bounce Back Against Astros ~ The Bucky Channel - The World of Sports from Wisconsin's Perspective. I just sat here for ten minutes trying to come up with a way to start this posting. I thought about Kapler, maybe something about Hardy. Thought about writing about Parra, or maybe about how the Brewers won the series. But as you can tell, I decided on none of those things. There really was no standout in today's 5-2 win over the Astros. It was about as much of a team effort as you could have asked for. Manny Parra was effective on the mound, although he only was able to last two innings, giving up two runs. Carlos Villanueva pitched two scoreless after that, followed by Gagne, and the 24th save of the year from Salomon Torres. Interesting sidenote, Gagne and Riske cleared waivers today, meaning they can now be dealt to anyone. I don't see them getting traded, however. As Ryan Braun continues to heal from an abdominal strain (should we be worried right now? ), it has been Gabe Kapler who has been taking his place the majority of the time. While Gabe is clearly no Braun, he has been proving capable in the last few weeks. Today, he chipped in with an RBI single, and a great throw to get Mark Loretta at home. Elsewhere, Rickie Weeks scored three times, Prince Fielder had 2 RBI on sac flys, and J.J. Hardy went 2 for 4 with a home run. Not a bad team effort, all the way around. TBC's Player of the Game: Kapler. His outfield assist and RBI were very timely.